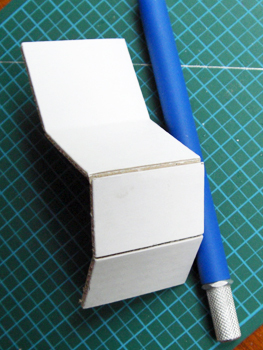 I thought I'd try making a little hood for my hob (stove top) out of some cardboard I had left from some packaging. I figured out the size I wanted the hood to be, then bent and then scored the card- board with an Exacto blade in the direction I wanted it to bend. I then cut some coffee-stirrers with scissors and glued them to the back to hold the ends together and to offer a bit of re-enforcement to the piece. 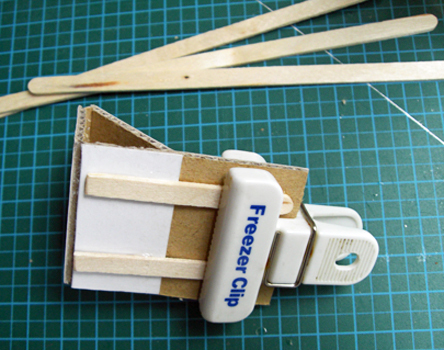 I clipped the whole thing together after it had been glued with a chip clip and some bobby-pins and let it dry. Earlier in the day I had my Avon order delivered and it came in a box made from shiny black card with a white back. 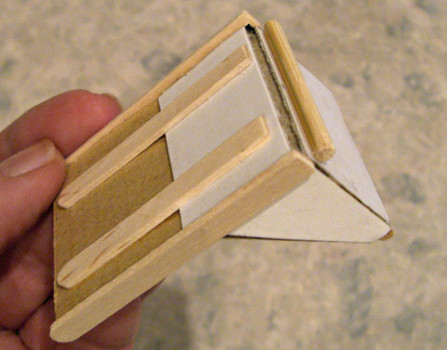 I cut the side pieces from the box and glued them to the sides of the thicker card board and let them dry. The front score left a large gap since the angle was sharp. I cut a length to match from a bamboo skewer. 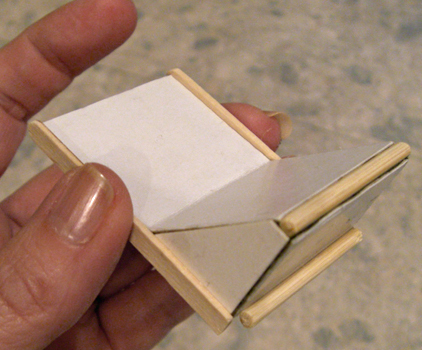 I then cut another length to glue to the bottom to represent the hinge. 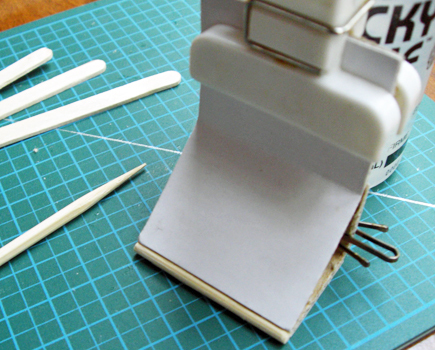 I then cut some more coffee-stirrers to glue to the sides to give it a more finished look. I spread out newspaper outdoors and set a bottle with a screw-top on it in the middle. I made a plug with some Blue-Tack to use as a handle and mounted that to the bottle top. 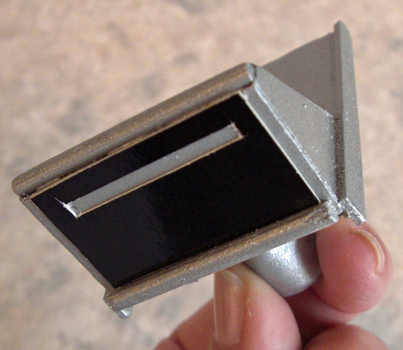 I then spray painted the entire unit with silver Hammerite paint which gave it a dull stainless steel appearance. I cut more of the Avon box and used the black side this time and glued it to the bottom of the hood to represent the light and grease filter. To the left you see the finished hood over the hob. The handles for the tap are the backs to earring studs with a red and green pin head stuck through them. The pins are cut, glued then stuck through tiny holes I drilled in the unit. The refrigerator is a cardboard box that dog eye drops came in which I carefully opened out then folded back together, then taped together with the white side out. I then glued it on top of a bit of wood that is painted silver. The handle to the fridge is the clip to took off of a cheap ball point pen. 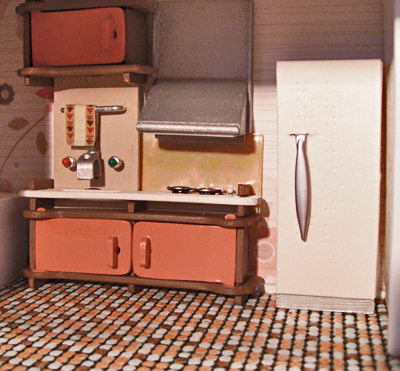 Eventually I'd like to have the refrigerator made from wood, but for now, the illusion is fine.